Respect The Mustache shirt because you are man in all his facial hair glory! Respect the mustache shirts using a retro design and hilarious imagery to garner respect for man's greatest decoration, his mustache. 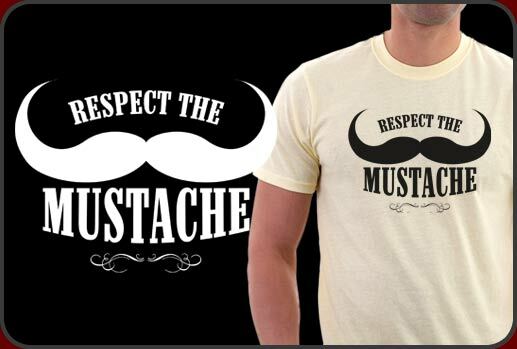 Respect The Mustache is a must have t-shirt for any man who's proud of his facial hair and wants to show it. This really is a hilarious t-shirt and makes a great gift for mustache wearers. Actually, if you don't mind getting kicked in the tinglies you could give a Respect The Mustache shirt to any hairy women you may know. Just don't say we gave you the idea. The Respect The Mustache design comes in two styles. One in white and the other black so that you can select either light or dark colored shirts when making your purchase. We also have available some really cool gift items with the Respect the Mustache design. The wall poster is perfect for a den, bar or if you know a barber, it would make a great gift for their shop.